Also serving communities of Newport, South Beach. The average cost of assisted living in Lincoln City is $2,845 per month. This is lower than the national median of $3,345. To help you with your search, browse the 13 reviews below for assisted living facilities in Lincoln City. On average, consumers rate assisted living in Lincoln City 3.6 out of 5 stars. Better rated regions include Dallas with an average rating of 3.8 out of 5 stars. Caring.com has helped thousands of families find high-quality senior care. To speak with one of our Family Advisors about assisted living options and costs in Lincoln City, call (855) 863-8283. Lincoln City, located on the Pacific coast, offers a myriad of things for seniors and their families to enjoy. Many are free, such as collecting sea glass and shells on the beach and taking part in the annual kite festival. Lincoln City also offers a variety of places for seniors to live, including two assisted living facilities (ALFs). These facilities, which are regulated by the Oregon Department of Human Services, offer secure and friendly residential communities as well as assistance with day-to-day tasks like grooming and remembering to take medications. Lincoln City has an array of community resources for seniors, including the Oregon Cascades West Council of Governments (OCWCG), an agency that offers meals, nutrition services and transportation for residents age 60 and older, as well as a senior center. Living in Lincoln City (and much of Oregon) is much more expensive than living in other parts of the United States. In fact, the overall cost of living in Lincoln City is 10 percent higher than the national average. This could be a concern for seniors living on a monthly pension or Social Security check. Lincoln City's location on the Pacific coast keeps the city from being too hot in the summer and too cold in the winter. The average high temperature in Lincoln City in January is 47 degrees Fahrenheit, and the average high temperature in July is 70 degrees, making it a comfortable place to live for seniors. Crime is a major concern for Lincoln City residents. While the overall crime rate in the area has decreased by 12 percent in recent years, it is still nearly twice the national average. Residents in the city have a one in 18 chance of being a crime victim in any given year. Lincoln City is connected to other cities along the Pacific Coast by US 101 (the Pacific Coast Highway), which runs right through town. For public transportation, the Lincoln City Loop provides scheduled bus service around Lincoln City and Dial-a-Ride offers on-demand, curb-to-curb bus service. Neither service offers a senior discount. The Lincoln City, Oregon area is home to world-class medical facilities including Samaritan North Lincoln Hospital, in the event of medical emergencies or illness. Assisted Living costs in Lincoln City start around $2,845 per month on average, while the nationwide average cost of assisted living is $4,000 per month, according to the latest figures from Genworth’s Cost of Care Survey. It’s important to note that assisted living rates in Lincoln City and the surrounding suburbs can vary widely based on factors such as location, the level of care needed, apartment size and the types of amenities offered at each community. Eligible Lincoln City area seniors can take advantage of a number of government programs to help with the cost of an ALF, including the Community First Choice Plan, and Supplemental Security Income Category G.
Lincoln City and the surrounding area are home to numerous government agencies and non-profit organizations offering help for seniors searching for or currently residing in an assisted living community. These organizations can also provide assistance in a number of other eldercare services such as geriatric care management, elder law advice, estate planning, finding home care and health and wellness programs. To see a list of free assisted living resources in Lincoln City, please visit our Assisted Living in Oregon page. Lincoln City-area assisted living communities must adhere to the comprehensive set of state laws and regulations that all assisted living communities in Oregon are required to follow. 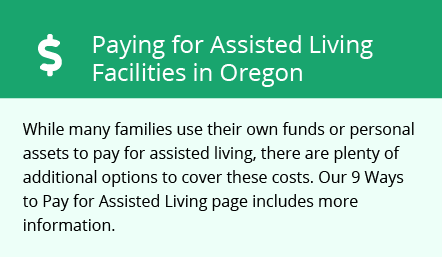 Visit our Assisted Living in Oregon page for more information about these laws.